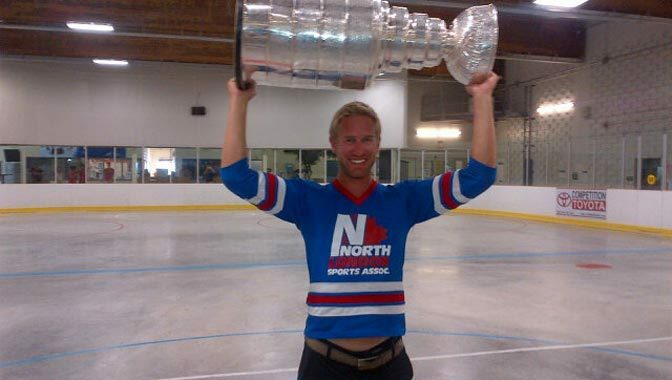 LONDON, Ontario -- Quiet, reserved and private are three words that aptly describe Jeff Carter, so it was fitting that they summarized his day with the Stanley Cup just as appropriately. Surrounded by friends, teammates from his junior days with the Sault Ste. Marie Greyhounds, along with immediate and extended family in his parents' back yard, Carter reaped the benefits of his first championship with the Los Angeles Kings just two years after falling two games short as a member of the Philadelphia Flyers. The shock and sadness Carter felt after his trade from Philadelphia to the Columbus Blue Jackets 14 months ago was something he and his family talked about Friday, but everyone acknowledged that the situation couldn't have unfolded any better for the 27-year-old. "This is what it's all about," Carter said. "You look back on it now, and obviously at the time, it was tough to take. I loved where we were at and I never wanted to leave. But we're sitting here today with the Stanley Cup, so it's pretty unbelievable." Carter, who was traded to Los Angeles in February, didn't make any public appearances with the Cup on Friday. He joined teammate and fellow London native Drew Doughty on Thursday at City Hall, took part in a makeshift parade after meeting police officials, and took pictures with the Cup and fans at John Labatt Centre, home of the Ontario Hockey League's London Knights. With that out of the way, Carter had about 30 people over to the home of his mother, Sue, and father, Jim, whose hockey career highlight was being selected between Hockey Hall of Famers Mike Gartner and Dino Ciccarelli in the 1976 OHL Draft. Jim never reached the NHL, but he coached Jeff until he left home at 16 to play his junior hockey about seven hours away. Carter has been one to shy away from the limelight during his NHL career, but he was happy to oblige on this day. With a few of his junior teammates on hand, Carter offered a tip that someone in his back yard had to have an embarrassing story about him, and it turned out it was Jordan Smith. Smith played four years with Carter at Sault Ste. Marie, the only two players who started their careers in 2001-02 and lasted until 2004-05. Smith's career was cut short by an injury that cost him his right eye, but he was happy to celebrate Carter's special day and even happier to tell the story of Carter's first career fight with Nick Van Herpt of the Kingston Frontenacs. The way Smith tells it, a melee broke out when Carter had a knee-to-knee collision with the Frontenacs goaltender. Things escalated when Trevor Daley, who is now in the NHL with the Dallas Stars, "pitchforked" another player. The lean and lanky Carter wound up squaring off with Van Herpt and used his reach to pummel him to the ice. Carter and Smith, who said he won his fight quite handily too, were both ejected. After the game, Carter asked his dad how he did in the bout. According to Smith, the proud father asked his son why he stopped throwing punches in a fight he was clearly winning. "Jeff told him he was crying so he didn't want to hit him anymore," Smith said. Carter, who has had four fights in his entire career, was beaming when telling the story. "Everybody got into a big scrum, and I honestly couldn't tell you how myself and the other guy hooked up," Carter said. "We got into a fight. I've been in two fights in the OHL and two fights in the NHL, so I'm not a fighter. But I feel like it went pretty well for myself. I was pretty proud of myself. I just went squirrelly, I guess." Memories shared about Carter's younger days highlighted the morning, but they weren't all about his one-sided win in a bout he helped start as a 17-year-old. There was also some gushing from his billet mom, Debbie Campbell. "Jeffrey came to us when he was 16 years old; he was so sweet," Campbell said. "We had him for four years, and Jeff isn't really a huggy kissy guy. But every time before he'd go to a game, I'd say, 'Jeff, you have to give me a hug.' Now when he sees me, he automatically comes up and hugs me." With the embarrassing stories and tales of heroics out of everyone's systems, Carter took the Cup to his mother's workplace so employees could take pictures with it and offer their congratulations to Carter. After an hour baking in the sun, the party moved indoors to Stronach Arena, the rink where Carter played ice hockey for the first time as a 7-year-old and where his dad also began playing as a child. The ice was gone for the summer and replaced with a court suited for ball hockey, but Carter parked the Cup where center ice would be for a fashion show that was a blast from the past. Carter lived up to the nickname his childhood friends gave him -- "Skinny" -- and donned the North London Sports Association jersey he wore as a 7-year-old with No. 7 on the back. It was ill-fitting, sure, but Carter was able to slide it on for pictures. He threw on his Greyhounds jersey for photos with his family and draped a Kings jersey on the Cup. It was a day in which every chapter of Carter's life was relived to some extent. "I'm speechless. It's unbelievable," Sue said. "It's been amazing. It's hard to believe it's even really happening. I'm looking at him and in the past year, to be right here with the Stanley Cup here, this is so special to his dad and me because this is where they both started." Carter said, "This is as good as it can get. I've won world juniors, Calder Cup and now the Stanley Cup. For a Canadian boy growing up, you dream about winning the Stanley Cup. When you have the chance and it actually happens, it's almost a surreal feeling. Today, bringing it back to my family and friends, it all kind of comes together and it's pretty special."